"I must admit, I love good food. My father and I share the belief that if we have to eat it should be good. A few years ago this conclusion was a big problem for me because I was an expert at burning water…so I set off on a journey to learn to prepare amazing food. Five years later I’m proud of my culinary skills and find feeding large groups to be so much fun, especially because I only do it on special occasions and never do the dishes after! Although enjoyed all over the country, Nanaimo Bars are a western Canadian design. A thick layer of chocolate atop the middle layer of sweet and rich creamy custard buttery icing, all atop a thick crumby chocolate/walnut/coconut base makes this square a finger-food dessert. As a little girl, Nanaimo Bars were one of my faves at showers and parties…except I hate the bottom of them! Thankfully, my dear cousin Jessica loves the base layer and hates the top two. I’m sure you can image two little girls snagging (another!) treat from the dessert buffet and splitting it. She often had to tell me she was done, as her sweet tooth wasn’t nearly the size of mine, so I’d go and find my mom who also loved the bottom layer. (Just a little tip: Chill them before splitting, otherwise you’ll wind up with a gooey mess.) Recipe here! What would Canadian cuisine be without poutine? (Pronounced poo-teen or poo-tin or pass-me-that-now-because-I-can’t-resist-it, depending on the person with whom you are sharing this dish!) French fries, or ‘chips’ as they are known to many, are fried to perfection, covered in cheese curds, and smothered in gravy. You’ll find many variations, some adding meat or spices. I once met a chef who boasted that her classic poutine recipe took 5 years to perfect – from potato to cheese curd to gravy, the combinations were tried thousands of times; truly was a treat to stop and enjoy, unfortunately her doors have closed. For our American friends who would like to indulge, I’ll meet you at Leunig’s Bistro in Burlington, Vermont for a twist on this favourite, Confit Duck Poutine; to our Canadian friends I promise getting a passport will be worth this one. Ok, one more. Let's not forget butter tarts. Butter, sugar, eggs and sometimes raisins all baked in a delicious crust! Goodness in just a few bites!" Did we mention dill pickle chips, the magnificent Bloody Caesar, smoked salmon, Montreal style bagels and Saskatoon berry pie! Hungry yet? We'll get to the maple syrup later! As mentioned in our first post, we would love to share a loonie and a toonie with lucky readers each hour (along with some other fun prizes along the way!) Be sure to leave a comment below by July 7th and we will randomly select one lucky winner this hour to win them! After leaving your comment here we hope you'll take a moment to visit us on Facebook and Instagram (@sctmagazine) and leave a comment there as well for THREE chances to win! We'll be compiling all the comments each hour. Next hour, it's the Bay of Fundy! Fun Fact: Canada consumes more macaroni and cheese than any other nation in the world. Thanks Kraft Dinner! Announcing our newest design team member and a GIVEAWAY! Last Day to Enter and pre-order! Celebrating Canada’s 150th birthday – our grand finale! I love Nanaimo squares and butter tarts! Poutine and Nanaimo bars make me ? happy. I know it’s weird, but I think Nanaimo bars are too sweet, but I love butter tarts! No rhyme nor reason to that one… Also, poutine is wonderful! watching some of the cooking shows. Have to try it sometime. I love all the foods mentioned…who wouldn’t. I grew up in Leamington, home of the delicious tomatoes which went into making Heinz ketchup although sadly they don’t anymore, however, French’s stepped up to the plate so Yeah! There is nothing like the taste of a fresh Leamington tomato/ If you get the chance to visit, check out the big tomato in town which is a tourist information booth. Yum! Dull pickle chips, Hawkins Cheezies and Smarties! Love our snacks! Mmm… Yummy!!! They looks delicious!!! Yummy foods all! I love everything on the list! I will admit I am a Canadian who puts Ketchup on everything. Love my Ketchup chips! But I have to say I would never pass up a Nanaimo Bar. Mmmm….all my guilty pleasures! These are all great but my favourite has to be butter tarts. Whoever invented these is a Canadian genius. Happy Birthday, Canada! Happy Birthday, Canada! I love tarts! My grandmother always made them and now my mother and I make them. There will be thousands of tarts and nanaimo bars consumed today along with poutine and/or french fries and ketchup!! As a teen I worked at a little snack bar that was run by a wonderful Canadian man who came to know my love of poutine! After he closed down for the winter he would make me a poutine survival package once a month. It consisted of a gallon jar of his homemade gravy, a bag of curd cheese and a 5lb bag of potatoes so I could still get my fix! Years later, he made poutine for all of our wedding guests! I really miss him and my poutine fixes! I guess I will have to get my enhanced license so I can go to Canada for poutine regularly! I have never heard of the Nanaimo bars but they look ? yummy! TFS! Happy 150 Canada from the prairies! Coffee crisp! A delicious Canadian treat is one of my favorite foods! Love Nanaimo bars and butter tarts. I don’t put catsup on anything (although hubby does). Do not like KD. Canada sells the most varieties of chocolate bars! Hurray for Canadian food! going to try the nanaimo bars that will be a first for me. Poutine – oh my! Born and raised on Quebec, the birthplace of poutine it was definitely a favourite. Now if someone would just create a gluten and dairy free option I woukd be in heaven! So hard to pick my favourite, they’re all delicious! Happy Birthdat Canada! Loving the Canadian facts. My fav treat are Nanaimo bars. Love them. Happy Canada Day everyone! We have a lot to be thankful for. We live in an amazing country!! May we all live in peace and harmony. I need a cup of Tim Hortons to go with all these! Nanaimo bars sound absolutely delicious. Will have to try them soon! I love to eat entire Nanaimo bar! All of it is good. Butter tarts yum! Poutine…not so much. Love our Canadian money! So fun and colourfulness! My Mom made the best butter tarts in the world. Every time I eat one I think of her. Gosh, I’ve forgotten about the Nanaimo Bars. How could that happen. Will be making them this week for sure!!! I’ve always had a passion for Ketchup. I even carried a bottle of it around with me in my car. One Halloween night, I was stopped by a policeman and he made me put my Ketchup in the trunk of my car. I guess he thought I was going to splatter it on a building or something. To this day, I don’t know why he stopped me. Mmmm our celebrations are centred around eating today ? Ok – you’re making me SO hungry! Love French fries and pies, so poutine and butter tarts both sound delicious! Happy Canada Day! Making me hungry…off to put maple syrup on pancakes! This all looks yummy –esp the dessert. Wow, such interesting food facts… I had no idea that Nanaimo bars were a Canadian recipe….they are one of my favourite desserts to eat and so addictive! Thanks for all of the fun info..I am enjoying your blog today with all of these photos and fun facts! Love nanaimo bars and butter tarts! And lots of maple syrup! We do live in a great country! Oh yummy! Great Canadian dishes and now I NEED some poutine!!! And a butter tart! I love learning all of these great things about Canada. Very interesting. I love all of these tried and true Canadian favourites!! I love Nanaimo bars! Happy Canada Day from Saskatchewan ??! Going to make those bars for the 4th of July in Utah!! Yummy! I have not tried any of these dishes, but that’s about to change. Thanks for the dessert recipe, can’t wait to try it. Can someone please hand me a Nanaimo bar and a butter tart? Would love the try those. As for gravy on french fries? No thank you. And I only use ketchup sparingly, e.g. with a croque monsieur (‘tosti’ in Dutch). I have tried all of these Canadian yummies but they are more of a “treat” than a regular part of my diet. I did not know the fun fact about Kraft Dinner but it makes sense now that I see it! Thank you for celebrating Canada 150 in style! I am so happy to be Canadian! Thanks for sharing these fun Canadian food facts – always fun to learn about another country! But I do LOVE butter tarts! Happy Canada Day from British Columbia. Mmmmn… been debating making poutine for dinner tonight! I think it’s happening! Love the recap of our fave foods 🙂 I do love ketchup but maybe not as much as others … in my world, the only places it belongs is on fries, hashbrowns, meatloaf and burgers!!! I am getting really hungry now. I have made Nanaimo bars for years. At Christmas I add some green food colouring and mint flavouring. After the first time I now HAVE to make them. Be sure you know what you are getting into before you start! lol And yes, always make sure they are chilled before cutting and serving. Not a good summer time treat. Better saved for cool temps. As for poutine, if you aren’t putting the cheese on top of the fries the second they come out of the fryer so the curds are melting down around the golden potatoes before you even add the scalding hot gravy, don’t bother wasting your time. Seriously, who wants cold clumps of cheese? And the butter tarts. Mmmmmm….with our without the little raisins, they are always a temptation. So much fun food has come out of our country. We know how to eat! It all sounds delicious and I am sure they have less calories in Canada, since we use the metric system ? Happy Canada Day! Sweet Treats, Canada!!!! Happy Birthday! Oooh, Bakeapple Buckle. There’s something no one in America has ever heard of. Thanks for the opportunity to win. All of the food you shared look and sound yummy. Now I need to go to Canada so that I can try some of them. I have never had any of these treats, but they all sound delish! I could go for the nanaimo bars and the butter tarts. Those both sound yummy ! So my kids would be very happy in Canada putting ketchup on everything? I’d love to try butter tarts, and basically, everything else mentioned! I love our Canadian foods!! So many yummy Canadian foods! Happy Canada Day! Hasn’t every Canadian lived on KD at one time or another????? Happy Canada Day! i am eating ketchup chips right now and some ketchup on my hotdog! Yummm! Butter Tarts and Nanaimo Squares. Thanks for the recipe. Can’t wait to try it. Can’t wait to try some of these…maybe in Cornwall?! Love the foods of Canada! Yum! thanks for the chance to win! OMG – which do I love more….nanaimo bars or butter tarts! I love all the Canadian food you posted,! Thank you so much! What’s not to love about all those Canadian foods. Oh yummy! Must try these! It’s so hard to pick authentic Canadian cuisine but these are a great start! I love Nanaimo bars! Poutine and butter tarts – a perfect Canadian feast! Yum! The nanaimo bars look awesome! Nanaimo Bars are the best and I had one today. Happy Canada Day Everyone. I used to love Nanaimo bars!! Ohhhh so good…. one of the things I miss but have not looked for a tree but free recipe. And poutine. .. yum!! That’s it. Just yum! Nanaimo bar cheesecake for Canada Day, enough said! Yummy…my mouth is watering with these delicious Canadian treats. Love poutine! A staple in my home! Ketchup on almost everything is common in Sweden aswell. Your Canadian food selections are terrific. I did not realize that butter tarts were Canadian until I attended the recent Buttertart Festival in Midland. While waiting in line I met a gentleman from the USA who told me he had come up to Canada in order to get himself some butter tarts!!! Just another reason Canada is so terrific!!! ❤️?? Who else would like buttertarts when they are scrapbooking?? what a great combination!!! Butter tarts my fave! ?? Ooh, the butter tarts look fabulous! I haven’t heard of nanaimo either. So delicious-looking. What a fun day! Thanks for the chance to win something. Butter tarts!!!! Now I have to go and make some!! Some of all the great food found in Canada. Thanks SCT for the great facts of our great country. Some of my favorite memories include the Canadian food you have mentioned! Who could resist such treats? A poutine and a Jos Louis, the lunch of Canadian champions! Loved eating these treats as a kid. You certainly had my mouth watering with all the amazing Canadian favourites! I used to work for a Canadian software company and learnt to make Nanaimo bars after trying them. One of my colleagues used to regularly bring in butter tarts – delicious! Would love to try poutine one day. My grandma made the best nanaimo bars and butter tarts. Although I’ve found delicious ones made by other people, they aren’t quite the same – probably because they are missing her special ingredient love. Whenever I have either one of them, I think of my grandma. I love Nanaimo bars. My very favourite treat, and thank you for including a recipe. So many delicious food memories here. But, please let’s not forget, fresh lobster from PEI, fiddle heads, sugar pie from Quebec City (a close relation to butter tarts), hawberry jam from Manitoulin Island, fresh wild salmon from BC or delicious Alberta beef. And so many more other amazing foods, some I have tried and others I look forward to . Nanaimo bars are not my favourite! Too sweet. I’ll eat a butter tart once in awhile but again, too sweet most of the time. I seldom eat fries or ketchup – sorry, vegetarian and healthy eater (most of the time) but hubby loves anything sweet. Happy Canada Day !!! These hourly posts are a super creative way to honour our fabulous country. Nanaimo bars and butter tarts – so yummy! I love the food facts. I have the bar recipe pinned to make in the future. Nanaimo bars are soooo good. All the layers! Yummy butter tarts. Happy Canada Day ?? I think my husband must be secretly Canadian for his love of ketchup! The fun facts are great. Thank you. 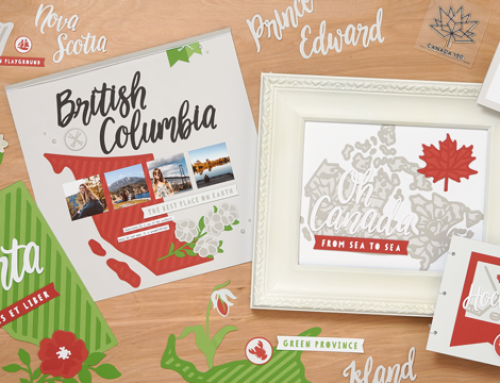 Would love to win the Canada stamp and die set. Great ideas from your blog. Keep up the good work! I tried delicious Nanaimo Bars when in Canada, but also icewine and maple whisky.Though I think the whisky is probably drunk more by visitors than locals. Canadian club is a massive favourite here in Australia. I grew up in Eastern Canada and we ate tweed squares. Still a great treat. Thank you very much for this wonderful homage to Canada and its marvelous opportunities. Having had the opportunity to visit Vancouver Island, those Nanaimo bars hold a special place in my sweet heart. Cheers! Now I’m very hungry after reading that! Happy 150th Canada! I had on Canada Day a Nanaimo Bar Buttertart….the two together is magical!! If you get a chance go to the The Magic Pin in Peterborough and try one!! Delicious! !